Condenser Microphones and DI Boxes that have active circuitry in them require electricity in order to function. Some Condenser Mics and Active DI Boxes have slots to insert batteries. But, no one wants to have to constantly replace batteries. Phantom Power to the rescue! 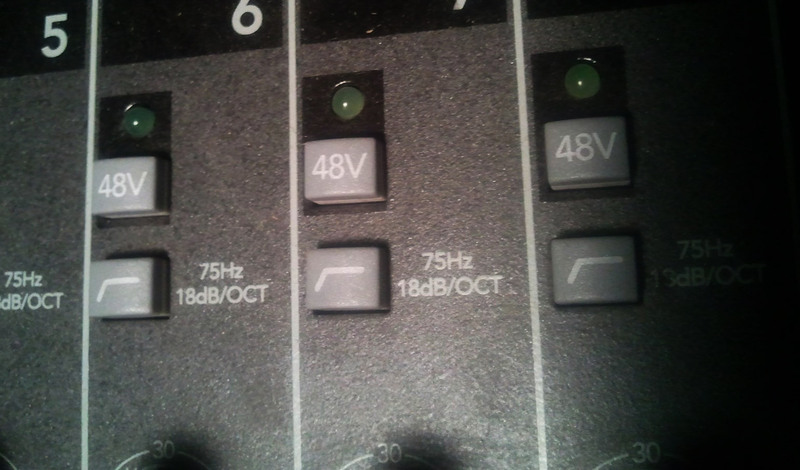 The phantom power button on a Soundcraft EFX8 soundboard. Phantom Power is DC Voltage (just like battery electricity) that is sent from a phantom power supply through an XLR cable to the Mic or DI Box at the other end. 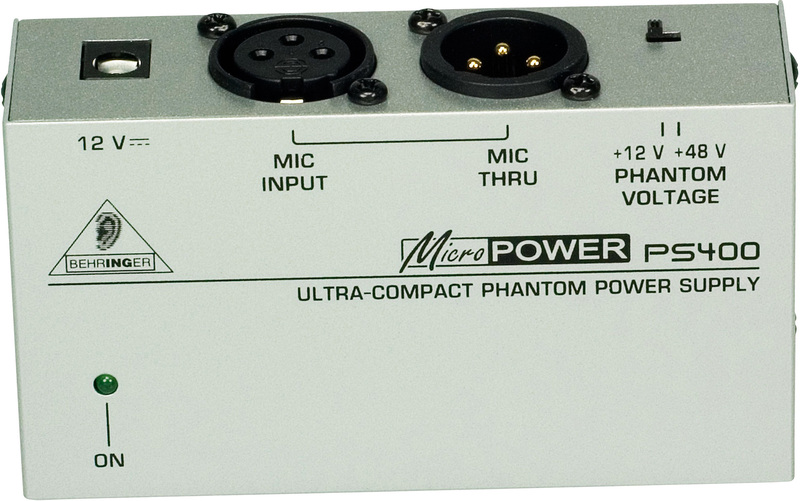 Phantom Power Supplies can be stand alone units, but are most commonly built into soundboards. On smaller and lower end mixers, there will be one phantom power button or switch. Once enabled Phantom Power will be sent to all XLR channels. On larger and higher end mixing boards, each channel will have it’s own Phantom Power button or switch. Generally stand alone preamps, used in recording studios, will have a phantom power button or switch. The amount of voltage generally supplied is 48 volts. However, many condenser mics and DIs don’t require a full 48v. Some only require 9, 12 or 24 volts and have built in transformers to reduce the voltage and not damage the mic or DI box. Virtually all modern mics and DI boxes that do not require phantom power (dynamic mics & passive DI boxes) will not have any issues if sent 48v. They simply will not use it. However, some vintage equipment (notably vintage ribbon microphones) can be severely damage if sent phantom power. If you have the option, it’s best to only enable phantom power to the microphones that need it. As well, if enabling phantom power, it’s a good idea to mute the channel(s) that will be affected before enabling it. Enabling phantom power can produce a loud pop sound. Once enabled (after the pop) it should not produce any other unwanted sound. If it does, your microphone or cable may be wired improperly. Phantom power travels through the XLR cable on pins 2 & 3. Audio also travels through the XLR on pins 2 & 3. They do not affect one another. As long as the audio signal is balanced, phantom power does not affect the audio. You should not even know that it’s there! Hence the name, Phantom Power. Sneaky Sneaky! Difference Between Speaker Cable & Instrument Cable? Is there a difference between Instrument Cable and Speaker Cable? Instrument cable (commonly referred to as Patch Cable, 1/4″ Cable or Guitar Cable) is designed to carry a instrument level signal or line level signal over fairly short distances. Instrument cables have 2 wires in them. One wire carries the signal. The other is a ground wire. The ground wire is either twisted or braided around the signal wire in order to shield the signal wire from waves in the air that add unwanted noise to the signal. See Electromagnetic interference / radio-frequency interference (RFI) on Wikipedia for more information on this. The longer an instrument cable, the more susceptible they are to picking up interference. So, if you have a 100′ instrument cable, it will very likely be noisy. (no matter how good the shield is) For this reason, instrument cables should be no longer than 25′. The shorter the better. 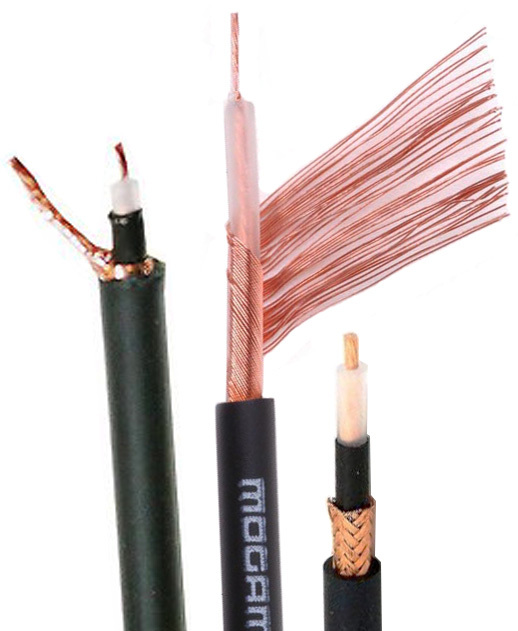 Speaker cable is designed to carry an amplified signal over short or long distances. Speaker cables have 2 wires in them. They are both the same thickness and type of wire. One wire is positive, the other is negative. There is no shielding on speaker cables. Shielding is not needed because the signal traveling through speaker cable is amplified. The strength of the signal is way higher than line level. Radio interference does not affect the signal because it is too quiet to be heard in comparison to the amplified signal traveling through the cable. The gauge of the wires in the speaker cable vary depending on how powerful the signal traveling through them will be and the length of the cable. The higher the amount of power needing to go through the cable, the thicker it should be. As well, the longer the cable is, the thicker it should be. Can I use one in place of the other? 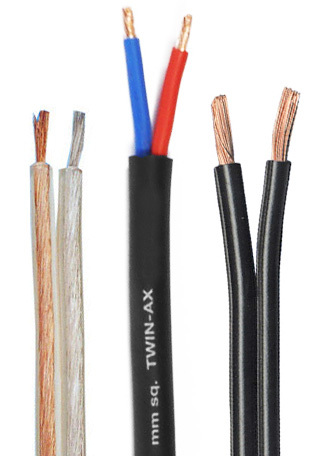 Both instrument and speaker cables may have 1/4″ connectors on them. They can be hard to tell apart, but are very different and should not be mixed and matched. If you aren’t sure if you are dealing with an instrument cable or a speaker cable, unscrew the connector and have a look at the wires. What happens if I use a speaker cable for my guitar? You will have a very noisy signal because speaker cable is not shielded. What happens if I use an instrument cable in between my amp and my speaker? You could also melt the cable and potentially start a fire. Instrument cables are not high enough gauge to carry an amplified signal. The low cut button. What does it do? It’s called a low cut filter because it cuts out all of the low sound below a certain frequency. 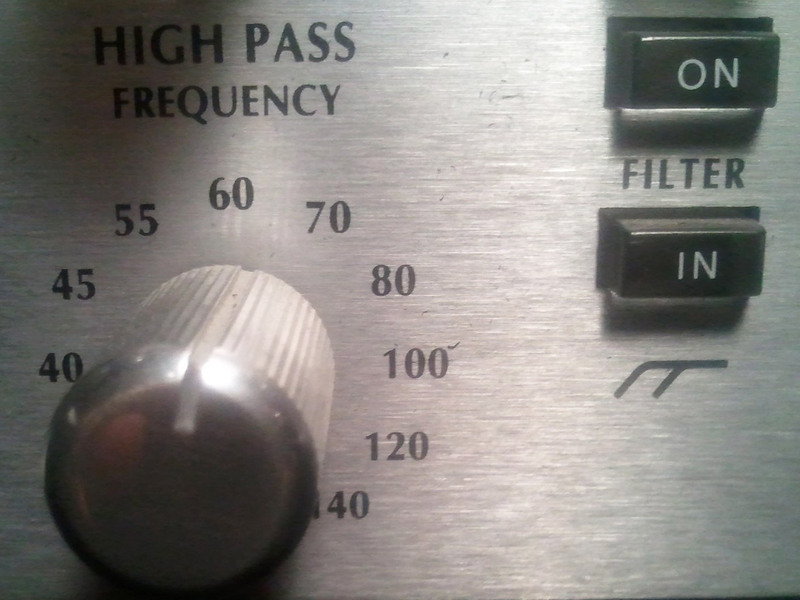 It’s called a high pass filter because it only allows the sound above a certain frequency to pass through. Both the same thing. On the majority of soundboards that ‘certain frequency’ is fixed, hence only having one button for it. On most boards the low cut is at 75hz, 80hz or 100 hz. On some higher end consoles and studio gear, you are given a knob to control what frequency the low cut is at. Some even let you control how gradual or steep the cut is. Why should I use low cut? By using low cut appropriately you can achieve a cleaner mix, get more headroom out of your PA and reduce the chance of low feedback. Low cut is, in my opinion, probably the most under-used feature on audio equipment. It is VERY valuable to have a low cut and can make the different between a clean mix and a muddy one. A Guitar Amp produces mainly mids. A Trumpet produces mids and treble. Voices very, but generally produce sound from low mids to treble. If you want a more in-depth look at what frequencies are produced from different sources, I recommend the following link. Unless the sound source for your channel is producing fundamental bass sound, you should engage your low cut. Doing so will eliminate the amplification of unwanted low sound. When mixing live, the question shouldn’t be, “Which channels should I turn the low cut on for?“. It should be, “Which channels should I take the low cut off for?“. Another plus to using low cut properly is, that when you reduce the amount of unwanted bass going through your PA, you will increase your headroom. This is because it is more work for your power amps to amplify bass. So again, cutting out the unwanted bass, will allow you to get more volume out of your sound system. Not to mention it will sound less muddy. Mic Preamps: What do they do? Why do I need a microphone preamp? The output volume of a microphone is very low. Most times, it’s too low to work with at all. If you have a mic plugged straight into a Mixer or Audio Interface without a preamp, there will not be enough signal. This will result in no sound at all or extremely quiet and poor quality sound. Modern day Mixers, Audio Interfaces and Audio Processing Units (compressors, EQs, FX, ect) are designed to accept a signal of +4dBu. The volume of typical microphone signal is -65dBu to -40dBu. This is why a microphone preamp (mic pre) is needed. Does it matter which microphone preamp I get? 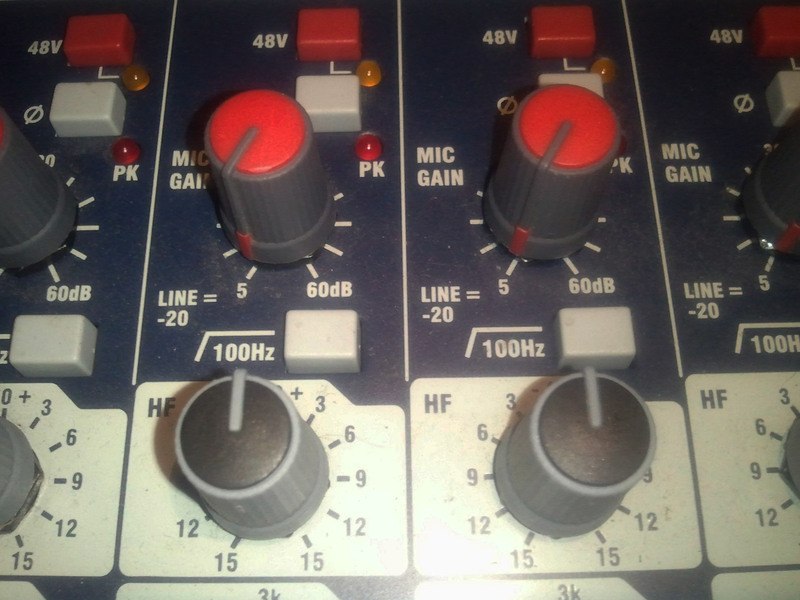 Microphone preamps are controlled by just one gain knob and that’s it. Very simple! If all they do is increase the volume, it doesn’t really matter which one you get, right? …… Wrong. Because mic pres boost the signal so much, they can really affect the sound. Similar to how the sound from different microphones vary. A mic pre can color the sound to make it sound warmer, shimmery, fatter, brighter, darker, brittle, muddy, dirty or just plain bad. They can also keep the sound very clean, transparent, neutral & accurate. Tube Preamps have glass tubes in them. Over time tubes may fail and need to be replaced . Many people try putting in different types of tubes to get different tones from their preamp. Tube preamps are larger, they produce more heat and they require more electricity than solid state pres. Tube preamps generally add color to the sound. They have the potential to make things sound very pleasing. As you turn up a tube preamp, the sound changes. The harder you push it, the more dirty the sound gets. The distortion a tube preamp produces is musical and generally warm sounding. So, you don’t have to worry as much about clipping your tube pre. In fact, many people purposefully make their tube preamps distort to achieve certain sounds. When it comes to microphone preamps, you get what you pay for! Don’t expect to get an outstanding studio quality pre for $100. The Speed of Sound: How fast is it? Question: What is the speed of sound? Sound is a wave. It needs to travel through something in order to move. The speed to which it travels greatly varies depending on what substance it is traveling through. The denser the substance is, the faster the sound wave can travel through it. Sound travels 1127 feet/second through Air. Sound travels 3041 feet/second through Helium. Sound travels 4862 feet/second through Water. Sound travels 21063 feet/second through Aluminum. Sound travels 39400 feet/second through Diamond. All of the above speeds are assuming that the temperature is 20°C (68°F). In solids, the density of the material (not the temperature) affects the speed that sound travels through it. More solid substances like aluminum conduct sound faster than air. Temperature affects the density of liquids and gases. The colder they are, the closer together the molecules become to one another. Because of this, one would think that as temperature in liquids and gases rise, the speed of sound through them would fall. However, this is not the case. Sound travels 4603 feet/second through Water at 0°C (32°F). Sound travels 4862 feet/second through Water at 20°C (68°F). Sound travels 5006 feet/second through Water at 40°C (104°F). Sound travels 5092 feet/second through Water at 60°C (140°F). When we look at the speed of sound through gases and liquids at different temperatures, something interesting happens! When the temperature is increased, the speed that sound travels through it increases too. This is because in gases and liquids, higher temperatures cause the molecules to move faster (and have more energy). Therefore, they can vibrate faster and sound waves can travel more quickly through them. Sound travels 1009 feet/second through Air at -40°C (-40°F). Sound travels 1048 feet/second through Air at -20°C (-4°F). Sound travels 1087 feet/second through Air at 0°C (32°F). Sound travels 1127 feet/second through Air at 20°C (68°F). 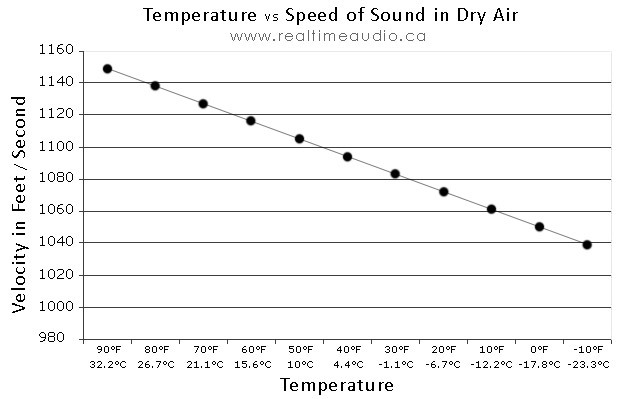 Sound travels 1166 feet/second through Air at 40°C (104°F). Humidity in the air has a very little, yet measurable effect on sound speed. Air pressure is often stated as a contributing factor to sound speed through air, however this is incorrect. Air density on the other hand is a contributing factor. The lower the air density the slower the sound travel will be. Although altitude has no effect on sound speed through air, it does correlate with air density and temperature which do. As you go up in altitude/elevation, the air density and the temperature drop. In a vacuum where there is zero air density, there is no sound at all! This is because there is nothing for the sound waves to travel through. Volume does not affect the speed of sound. Frequency (Pitch: Bass, Mid, Treble) does not affect the speed of sound. If you’re looking for more information about the speed of sound and how it’s affected by things, Wikipedia has some more great information. Marshall 410h -- What's in the box? - MarshallForum.com on Difference Between Speaker Cable & Instrument Cable? Bob Marley on What Is Phantom Power? http://Adrianart.com on Mixing Live: 3 Tips To Make It Sound Great!